One of the Greatest Battle of Antarctica begins now. Defend yourself and kill all your enemies to survive in this tower defense game. 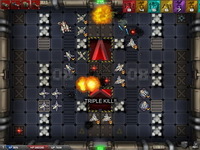 Your main objective is to destroy all your enemies by placing towers at the available zones. Click and place them from where you want to fire them. You will be rewarded with additional amount of money every time you kill enemies.